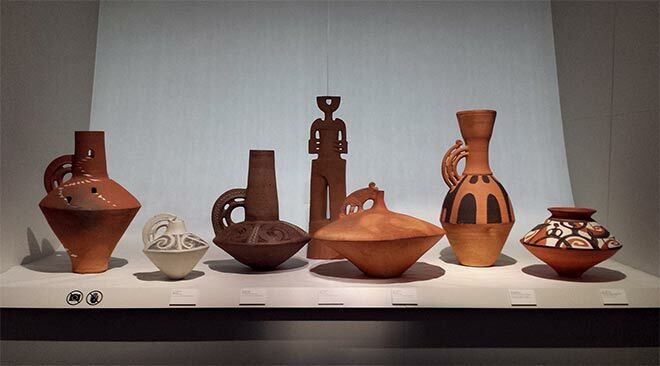 In 2013 Pātaka museum in Porirua curated an exhibition of the work of five Māori ceramic artists who had become leading members of the Māori clay workers' collective Ngā Kaihanga Uku. The collective had been established by Manos Nathan and Baye Riddell in 1986 and had its first hui the next year. The three other artists whose work appeared in the exhibition were Paerau Corneal, Wi Taepa and Colleen Waata Urlich. While each artist's work is distinct, they share a desire to express Māori traditions and graphic forms in their ceramics. Here we see some of the work of Baye Riddell. Permission of Waikato Museum – Te Whare Taonga o Waikato must be obtained before any re-use of this image.